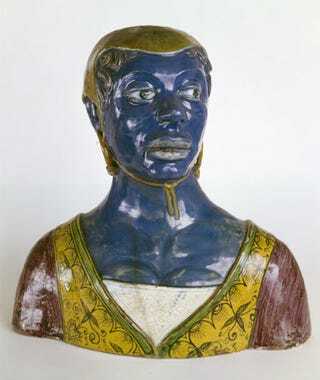 Anonymous, Italy, Bust of black woman, 16th century(? )Faience, Ecouen, Musée de la Renaissance. (The Root) — This arresting image is the first in a new weekly series that The Root is presenting in conjunction with the Image of the Black in Western Art Archive at Harvard University's W.E.B. Du Bois Institute for African and African American Research. As early as the 15th century, black people were imported from Africa to Europe. Their fate there was considerably different from that of the multitudes of slaves brought to the New World to perform agricultural labor. Often, blacks in Europe were at least nominally free and were considered to be servants rather than slaves. The woman represented in the bust here is usually described as a servant. In this case her elegant attire would distinguish her as a member of an aristocratic Italian household. Many servants possessed skills and talents very valuable to their employers. This woman could have served as a cook or as an attendant to the lady of the household. Her blue skin has a technical explanation, since the color black could not be rendered in glazed terra-cotta. The Image of the Black in Western Art Archive resides at Harvard University's W.E.B. Du Bois Institute for African and African American Research. The director of the W.E.B. Du Bois Institute is Henry Louis Gates Jr., who is also The Root's editor-in-chief. The archive and Harvard University Press collaborated to create The Image of the Black in Western Art book series.